1 - 4 Bedrooms, Sleeps 2 to 7 Changeover Saturday. 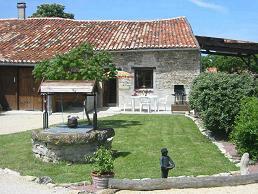 4 Self catering gites with pool. 2 mins from village shops and restaurant. Chez Maurit. Nr. Juignac, Charente. Prices from: £225 to £595 pw. La Medos. La Faye, Antigny, Vienne. Studio and 3 bedroom Gite. Prices from £210 to £890pw. La Vieille Fromagerie. Civray. Vienne. 1 & 2 Bedroom Gites, Sleeps 2-5, Changeover Sat. 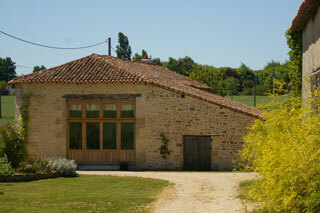 3 Luxury Gites with pool & children's play area in the heart of Poitou Charente. Rural Gite. St Jean D'Angely. Charente Maritime. 3 Bedrooms, Sleeps 7, Changeover Flexible. Traditional French family home, beautifully restored. Prices from: £180 to £350pw. Gites & B&B. Sleeps 2-6. Changeover Flexible. Luxury gite complex in the Charente. Child friendly. Hi spec barn renovation with large swimming pool. Prices from: €225 to €1125 pw. 4 Bedrooms. Sleeps 8. Changeover Saturdays. Superb barn convertion with lovely views and sunsets. Private pool, terrace and gardens,1 km to shops. Prices From: £550 to £890pw. 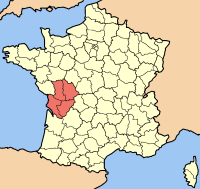 La Goulee. Torsac. Nr Angouleme. Charente. 4-5 Bedrooms. Sleeps 10. Changeover Saturdays. Spacious character stone property in pretty hamlet. Private pool, walled garden, tons of charm. Prices from: £650 to £1200 pw. Beautiful restored farmhouse and cottages in a rural location. furnished with all facilities, swimming pool,pool table,bar football & bikes. Prices from: £350 to 1560 pw. 3 gites with pool in restred Charentaise farmhouse. family friendly gites welcome families with babies, toddlers and young children.Enclosed garden and safely enclosed swimming pool. Coulonge Gite. Coulonge-sur-l'Autise. Deux Sevre. 2 bedrooms . Sleeps 6. We would like to welcome you to this charming Pool-side Gite with a FULLY ENCLOSED inground swimming pool, a boules court, table tennis & BBQ to enjoy. 2 Bedrooms, Sleeps 4 +2. ideal position for those wanting to explore this beautiful region, or just to sit back and relax in the sun. 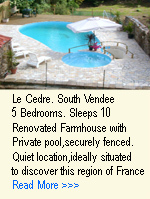 Two charming 3-star holiday gites which overlook an enclosed swimming pool. Des Arbres. Nueil les Aubiers, Deux Sevre. Offers spacious 3 or 4 bedroomed accomodation, mature garden and swimming pool, ideal setting for you to explore this region of France.